Surat: In a move aimed at drawing investments into the Odisha and for forging equitable growth across the country, Dharmendra Pradhan, Union Minister for Petroleum and Natural Gas, Skill Development & Entrepreneurship; inaugurated the first-of-its-kind Textiles and Plastics Investors Conclave here on Sunday in the presence of Pradipsinh Jadeja, Minister of State for Home, Law & Justice, Energy and Parliamentary Affairs, Govt of Gujarat. Sanjiv Singh, Chairman, IndianOil; Avinash Joshi, MD, ONGC Petro additions Ltd. (OPAL); Sandeep Poundrik, Jt. Secretary (Refining), MOP&NG; Aparna Sharma, Jt. Secretary, Deptt. Of Chemicals & Petrochemicals, were also present on the occasion. Projecting Odisha as a sound investment destination, Dharmendra Pradhan credited Prime Minister for Purbodaya and said, “Odisha has immense potential for the growth of the plastics and textiles sectors with convenient access to all the primary raw material needed. The region also has the necessary infrastructure, including ports, railway connectivity and road networks alongwith low-cost labour, that will facilitate the speedy development of the two sectors. Odisha presents a whole lot of possibilities and opportunities in the textiles and plastics industry with IndianOil providing the raw materials.” Urging investors to invest in Odisha, he added, “Craftsmanship & finesse are synonymous with the people of Odisha as entrepreneurship & business acumen is to the people of Surat. Therefore, it makes sense to showcase opportunities for investment in Odisha at Surat.” Speaking on the occasion, Pradipsinh Jadeja said, “Gujarat is the hub for both petrochemicals and textiles industries. The entrepreneurial spirit of the people of Surat has developed the city into a thriving economy based on textile & various other industrial clusters. The Investors Conclave will highlight the emerging investment opportunities in the downstream petrochemicals sector in Odisha and facilitate investments in the proposed Textiles and Plastics Parks in the eastern state of Odisha. Speaking on the occasion, Chairman, IndianOil, Sanjiv Singh, said, “IndianOil has invested Rs. 35,000 crore in Paradip Refinery. A new polypropylene unit of 700 KTA (kilo tonnes per annum) capacity is getting ready at the Paradip Refinery complex to support the plastics industry. Estimated to cost Rs. 3,150 crore, the plant is getting ready to be commissioned by the end of this year. We are also planning to set up an integrated PX/PTA Plant and a Glycols Plant at Paradip at a combined investment of Rs 13,000 crore. The PX/PTA and Glycols plants will provide the raw material to catalyse the development of a world-class integrated Textiles Park being planned by the Government of Odisha at Bhadrak.” “IndianOil has entered into a joint venture with IDCO to develop the Paradip Plastics Park, at an investment of Rs 106 crore, to provide a state-of-art manufacturing base for the downstream plastics industry in Odisha with support facilities ranging from warehouse for raw material and finished products, product testing facilities, etc. all under one roof,” he added. The event witnessed participation of a wide array of stakeholders, including vibrant young entrepreneurs, industry stakeholders and professional from the plastics and textiles industries. 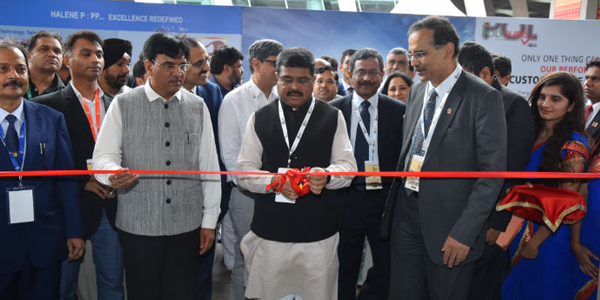 Dharmendra Pradhan and Pradipsinh Jadeja also inaugurated an exhibition on the sidelines of the Conclave in which various established players of textiles and plastics industries in Gujarat showcased their products & expertise. A knowledge paper showcasing mega opportunities in Textiles & Plastics downstream sectors in Odisha, prepared by M/s. Deloitte, was unveiled by the dignitaries on the occasion. An Investor Facilitation Centre was also set up in the Conclave to guide the prospective investors in Plastics Park at Paradip and Textiles Park at Bhadrak. Representatives from Central Government organisations, State Government, IndianOil and financial institutions were available to guide the investors in this facilitation centre.